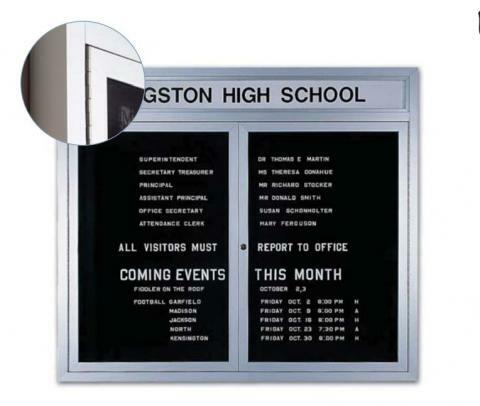 Announce monthly events with the highly-durable Business Message Board!Professional notices and announcements deserve the very best in quality bulletin boards. That is why we introduce the Business Message Board. We construct the message board with impervious tempered safety glass. The glass doors automatically close with our innovative continuous piano-hinged design. You never have to worry about inadvertently leaving the Business Message Board open. we secure the Business Message Board with a tumbler pin lock that only you can open with a key. With a 3/4-inch depth, you can utilize larger letters to inform your audience about event locations and upcoming important dates. Customer lettering on the 6-inch header proudly lists the name of your organization. The Business Message Board comes in seven sizes. Larger models contain two or three glass doors.